To provide both a formal and informal support network for all people who want to raise the issue of homophobia, biphobia, transphobia and heterosexism in education. To campaign on lesbian, gay, bisexual and trans issues as they affect education and those in education. To research, debate and stimulate curriculum development on LGBT issues. 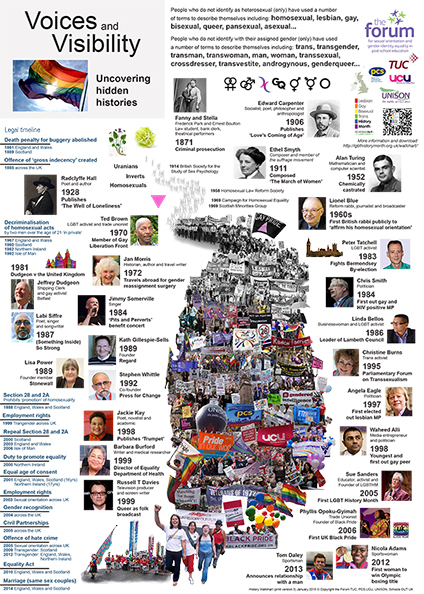 It is now LGBT History Month 2019. This year our theme is Peace, Activism and Reconciliation. You can enable the creation of an online digital resource to uncover hidden histories and strengthen the voices and visibility of lesbian, gay, bisexual and trans+ people in UK history. You can inspire a new generation of activists and build alliances to ensure the significant gains of the last 50 years are not lost by supporting the development of an interactive history resource. Donate today and you will make it possible to reach national and international audiences with this free and open digital resource.